Palm trees. Waterfalls. Flowers. Rain. Sunshine. Rainbows. This was our landscape while on our recent trip driving around the island in Maui, Hawaii. Roger and I celebrated our 30th wedding anniversary with a trip back to our honeymoon destination. We rented a Jeep® while on the island and had a blast driving down roads that only a 4-wheel drive vehicle should handle. The sites were just breath-taking stopping at overlooks along the way to view crashing waves against lava rocks and waterfalls that looked like they were coming straight from heaven. 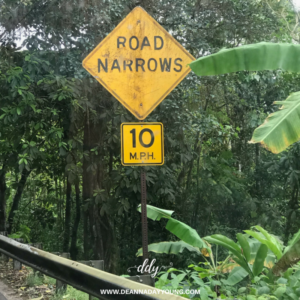 But there were many places on the Road to Hana that found us coming upon signs of “Road Narrows” or “Blow Your Horn Before Rounding Curve” or “One Lane Bridge. Yield to Oncoming Traffic”. It actually became a little tiresome and somewhat nerve wrecking taking those curves and narrow roads hoping that the oncoming traffic was yielding the same warning on the other side of that curve. This life is hard. We sin every day. We make wrong choices to go with the crowd down the wide road and it leads to destruction. If only we had warning that the next decision should be made with caution; if only we could hear a horn blowing to warn us that we were about to go down the wrong path; if only we had a big blaring neon sign to tell us don’t go the wide path with the crowd but follow Jesus down the narrow road. I think we do have those warnings within us and it is the Holy Spirit. But sometimes our free will takes over and we find ourselves in the spiritual battle of taking the wide road because it’s easier and feels better rather than taking the narrow road that may not be so popular or easy but we know is the right path. When you come upon these hard decisions this week, choose the narrow road and let Christ lead you around the bend where you know He is taking you. You won’t be able to see what’s coming but that’s why it’s called faith. This entry was posted on March 5, 2018 with tags: #hawaii by Deanna Young.